The US Surgeon General recently reported that e-cigarette use had grown 900 percent among adolescents from 2011-2015. E-cigarette use among students at the high school in the past 30 days is nearly double the national average for adolescents, according to a recent survey by The Red Ledger. Encompassing all grade levels, 30.4 percent of the survey’s 276 respondents had vaped, or used a device that vaporizes a flavored liquid for inhalation, in the past 30 days. This compares to the 16 percent national average among high school students according to report by the United States Surgeon General released in early December. However, senior AP research student Tyler Le said the statistical difference is no cause for alarm. Among respondents who vaped, 51 percent did so on a daily basis followed by 24 percent who have only vaped a few times before. The most popular reasons for vaping among respondents were curiosity, its relaxing effect, and its popularity among peers, though senior Emily Ottinger said she thinks vaping’s accessibility is also a factor. In a comprehensive report on the subject released in early December, the US Surgeon General, Dr. Vivek H. Murthy, determined that vaping is now a “major public health concern” due to its 900 percent growth among high school students from 2011 to 2015. “These products are now the most commonly used form of tobacco among youth in the United States, surpassing conventional tobacco products, including cigarettes, cigars, chewing tobacco, and hookahs,” said Murthy, in the report. “Most e-cigarettes contain nicotine, which can cause addiction and can harm the developing adolescent brain. The report focused primarily on the use of e-cigarettes by adolescents in its research, as well as highlighting the health effects on youth and the trends of the growing e-cigarette market. In compiling numerous surveys and research, the report found that those who had used e-cigarettes in the past 30 days accounted for 16 percent of high schoolers, 5.3 percent of middle schoolers, 13.6 percent of those 18-24 years of age, and 5.7 percent of those 25 years or older. Its research also showed that the most common reasons for usage were curiosity, flavor/taste, and a perceived lower harm compared to other tobacco products. In its research into the health effects of e-cigarettes, the report found that the variety of vaping methods, devices, and liquids has made comprehensive research on the effects of vaping challenging, leaving much still unknown on the topic. However, the report reiterated the negative effects of nicotine, which is commonly used in e-cigarettes, on a developing adolescent brain and its ability to cause birth defects if used during pregnancy. In the “Call to Action,” the report lists numerous strategies to deccelerate the rise of e-cigarettes among young adults including federal regulation of the products, promotion of prevention programs, and increased research into e-cigarettes. In accordance with the student handbook, students are not permitted to possess or use any e-cigarette or tobacco product while on campus or at a school-related activity, though assistant principal Bruce Coachman said he believes vaping has grown in popularity among the student population despite being prohibited. While state law currently has the same restrictions on youth e-cigarette sales as youth cigarette sales (purchase, possession, and use prohibited to those under the age of 18), Coachman said that he has disciplined students for e-cigarettes in far greater numbers than cigarettes. 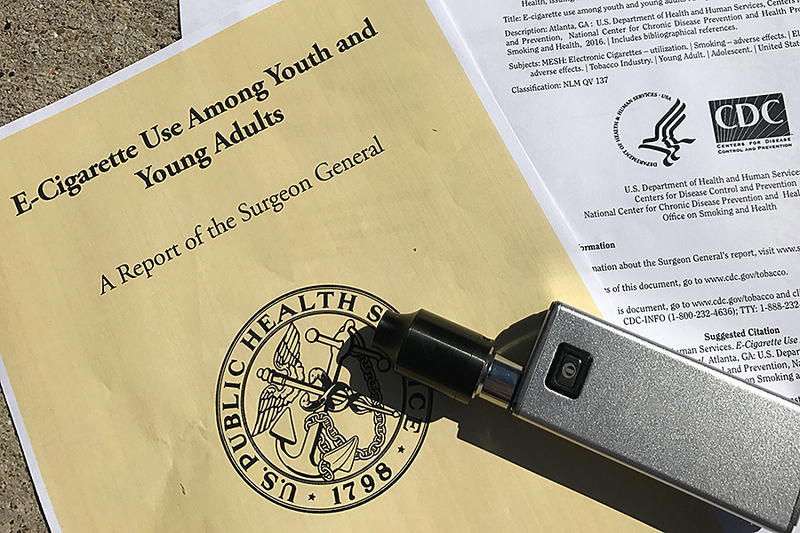 Outlined in its “Call to Action,” the surgeon general report supports measures to educate youth and parents alike about the risks of e-cigarette use among teens through programs and evidence based messages in order to curb the rising trend of use. While the surgeon general report found that quitting conventional cigarettes was not a primary reason for e-cigarette use by youth, another report by the Royal Physicians College of London found that e-cigarettes are used by adults exclusively for cutting down or quitting smoking and are an effective aid for this purpose. Becky Ridgeway, mother of juniors Claire and Grace, had been a smoker of conventional cigarettes from the age of 20 until two-and-a-half years ago when she decided to try e-cigarettes in an effort to quit smoking. Since then, Ridgeway said she has experienced a dramatic change in her health. Under state law, e-cigarettes hold the same restrictions as conventional cigarettes in public places such as libraries, theaters, and public transportation, with use allowed only in designated areas. Ridgeway said she has seen a great difference in social stigma between the two, despite how they are seen equally under the law. While Ridgeway said she her health has benefitted from the alternative vaping has provided, she urged teens to not take up vaping or any habit that can be addictive, noting that she regrets ever picking up a cigarette when she was young.